Day 2 dawned bright and fine, following cancellation of digging the previous day due to heavy rain and wind. 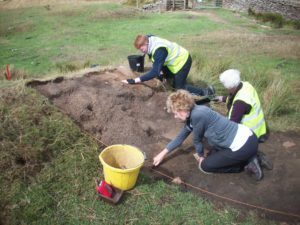 Work continued in Trench 1, and Trench 2 was opened in the ditch. The stones on the top of the bank were defined. In doing so, more of the compacted yellow clay layer was revealed. The stones were planned using the 1m2 planning frame. This shows that most of the stones are concentrated on the top of the bank. They were possibly used to reinforce the bank. The dark stripe was removed from the middle of the trench. This layer was not thick and could have been caused by water being retained in the ditch by the reeds. Cleaning back the rest of the trench revealed the compacted yellow clay layer extending throughout. A 2mx4m trench was opened in the ditch. Removal of the reeds revealed little turf. 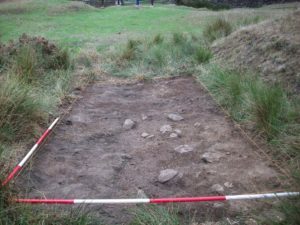 Two large stones in the east of the trench were measured and removed. It is thought that they have tumbled into the ditch from the top of the bank. Clearing back the topsoil revealed more stones in the north eastern corner of the trench. Further excavation revealed a thin piece of metal running ENE-SSW through the trench. 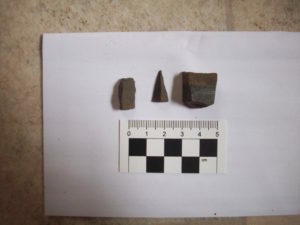 Due to the day nearing an end and the approaching rain, the metal object was excavated and found to be under the edge of the trench. Since this is an area which will be excavated later in the dig, the metal was followed beyond the edge of the trench. The metal object was in an area of loose soil. In the rest of the trench, a layer of compacted yellow clay was becoming visible.